Typically, on mobile websites, you need to key in 17-20 fields of information on a small screen while having to click and scroll through multiple pages to provide shipping and billing information. It’s no wonder up to 97% of mobile shoppers abandon their mobile shopping carts. Google Wallet makes it easy and secure for you. Simply click the Buy with Google Wallet button, log into Google Wallet and click to complete your order. That’s it — you’re done in 3 steps. 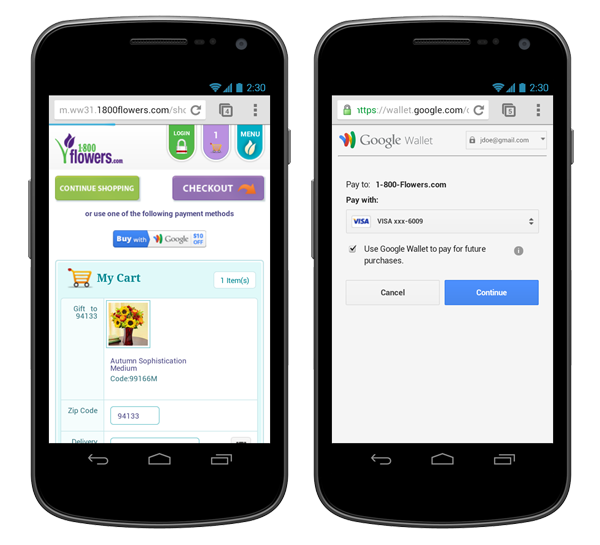 With Google Wallet, you can buy flowers and gifts at 1-800-Flowers.com quickly and easily on your mobile phone. You can also use Google Wallet to buy on Rockport.com and FiveGuys.com (at select locations). Pay without entering your credit or debit card number, billing address, or other payment information — it’s already securely stored in your Google Wallet. View your credit and debit cards, shipping addresses and transaction history conveniently in one place at wallet.google.com/manage. Set a default card for future purchases on your Google Wallet account, making future transactions even faster. Shop with confidence as all your payment and related information is encrypted and stored on secure servers and not shared with anyone. Not only does Google Wallet save you time, it can also save you money. For a limited time, buy with Google Wallet on your mobile device and get $10 off at 1-800-Flowers.com and $20 off at Rockport.com (some restrictions apply). We are working with a number of other exciting retailers to integrate Google Wallet on their mobile sites, including Finish Line, MovieTickets.com, Seamless, SwimOutlet.com and more, so stay tuned for more announcements. Making purchases on your mobile phone can be a lot easier. Starting today, on sites that accept Google Wallet, you don’t need to enter your credit or debit card number, billing address or other payment information — it’s already securely stored in your Google Wallet.